As ever, this post is brought to you in association with RALF from DP Software and Services. I’ve used RALF for the past 9 years, and it’s my favourite RAJAR analysis tool. So I am delighted that I continue to be able to bring you this RAJAR analysis in association with RALF. For more details on the product, contact Deryck Pritchard via this link or phone 07545 425677. UK radio is now more listened to via a digital platform than it is an analogue one. The rise has been steady over a number of years but as the chart below shows, we’ve finally seen the percentage of all radio listening breach 50% this quarter. As I said previously, while this theoretically should kick-start the process for a digital switch-over, I don’t actually foresee anything major happening at this point. What I’m not saying is that a great deal will happen very quickly once the 50% mark is breached. While theoretically allows processes to begin for an analogue to digital switchover for radio, I just don’t see that happening very soon. Generally speaking other things are using up lots of Parliamentary time at the moment. Similarly, I suspect that recently announced radio deregulation will take longer than many might hope, because there just isn’t time to fit in the primary legislation required to do anything. In July 2010 the Government launched its Digital Radio Action Plan. As part of this, it was requested that Ofcom produce an annual review of the digital radio market. The Action Plan was launched to ensure that if and when digital switchover occurs in radio, it can be delivered at a time when the market is ready and in a way that protects the needs of listeners. when national DAB coverage is comparable to FM, and local DAB reaches 90% of the population and all major roads. The Action Plan was finalised in November 2013, and on 16 December 2013 DCMS announced that while there had been steady growth in digital listening, it was not yet the time to commit to a switchover. The last version of the Digital Radio Action Plan was published in January 2014. And of course the one outstanding key challenge is in-car listening. At this point 33.4% of in-car listening is digital. That’s good, and the vast majority of new cars come with DAB as standard. But there are lot of other cars on the road. Elsewhere, it’s also worth noting that Q1 each year usually sees a bump in listenership because of devices sold over the Christmas period. This year, an awful lot of Amazon Alexa and Google Assistant devices were sold. But stalwart DAB radios always do well at this time of year too. Combined, they mean that post Christmas, people change the way they listen to the radio. Reach is up to 49.2m people a week, or 90% of the population. But average hours per listener have fallen below 21 for the first time, down to 20.8 hours a week. Inevitably that’s a consequence of other things eating into overall radio listenership. I hate to keep labour the same point every quarter, but this is being driven to a significant extent by younger listeners. 15-24s now only listen for an average of 12.7 hours a week, which is a whole hour lower than the previous lowest figure. To put this in context, five years ago this group listened for 15.8 hours a week. The one thing I would bring to bear from this, is that any formats or licences that target listeners by age groups – particular younger groups – are on a hiding to nothing. For example, Radio 1’s average age is 35 (down from 36 last quarter), and at this point, it’s essentially impossible to lower its average age. It has been a decent quarter for Commercial Radio, with reach up 1.5% on last quarter and 4.2% on last year, just putting it ahead of BBC Radio in overall terms. BBC Radio has more listening, despite seeing hours fall 3.2% on last quarter, and 1.5% down on last year. The BBC national radio networks have all seen some disappointing numbers this quarter. Five Live is perhaps most disappointing with a fall in reach of 5.7% on the last quarter, to 5.1m (down 3.7% on last year). Listening hours are worse being 9.2% down on the quarter and 13.0% down on the year. Such are the declines that I’d probably wait another quarter to be certain that they’ve not just had a bad RAJAR. While the Premier League hasn’t been the most exciting this year, there was plenty of football on during this period, and it was a generally busy time for both news and sport. Perhaps all the listeners have gone to 6 Music, because they’ve had another superb set of results, with record reach and hours. Reach is up 8.0% on the quarter (up 8.0% on the year), to 2.5m. Hours are up a whopping 12.3% on the quarter (and up a more modest 3.2% on the year). The interesting thing here is that 6 Music listeners might be considered to be the kind of people more likely to have Spotify or Apple Music (RAJAR doesn’t measure that), so the audience is rising at the same time as more of its audience has access to more music. Indeed, as with younger demos, 35-44s are seeing a gradual decline in time spent listening, which somehow 6 Music is overcoming. That said, the average age of a 6 Music listener is 43, and that has crept up from 38 over time. There’s probably an interesting question to asked around the musical breadth of knowledge of a 6 Music listeners – or at least their desire to have one – and the need for guiding voices in the stations’ presenters. On the other hand, a station that plays a much tighter playlist might have less demanding listeners, and therefore find itself more susceptible to listeners switching to playlists on Spotify et al. That said, listeners to those stations are probably less likely to spend £9.99 a month on music. But I’m hypothesising wildly here. Let’s get back to the numbers. Radio 1 will be disappointed with its fall this quarter after a decent set of results last time. It’s down 3.8% in reach on last quarter, although it’s up 4.0% on last year. Hours are also down, falling 7.7% on last quarter, but just falling 0.5% on last year. More worrying is that the average listener spends just 6.0 hours a week with the station. Radio 2 sees small falls too, with reach down a fractional 0.5% on the quarter while being up 2.6% on the year. Hours are down 5.1% on the quarter however, and down 2.5% on the year. The station has just made some of the biggest changes to its weekday schedule that it’s done for years, but it’s going to be another couple of quarters before we can see the first results of that. And even then, the most notable change in peak, is a slight change in hours of Simon Mayo’s show and the introduction of Jo Whiley to the mix. Radio 3 is down 0.9% in reach on the quarter, but up 2.6% on the year. Hours are somewhat better as it jumps 5.6% on the quarter and 2.7% on the year. Radio 4 ducks just below 11m in reach with a fall of 3.0% on the quarter (down 1.8% on the year). Hours are up 0.9% on the quarter, but down 4.0% on the year. It’s not as though there’s a shortage of news, but one suspects there’s only so much Brexit/Trump that some listeners can take, hence the slight dip in reach after a strong run of results in recent quarters. Radio 4 Extra has had a disappointing quarter with reach down 8.1% on the quarter, although up 3.1% on the year – which if nothing else shows that smaller stations can see their numbers bounce around. Perhaps more concerning is the 15.6% fall in hours on the quarter (and a 8.0% fall on the year). The World Service remains fairly consistent with 1.4m listeners down 5.1% on the quarter, but up 7.4% on the year. Hours are up slightly with 3.4% growth on the quarter and 2.3% growth on the year. Classic FM has had a solid set of results with reach down a little to 5.6m – down 1.7% on the quarter, but up 4.0% on the year. Hours are a little more mixed falling 4.1% on the quarter yet rising 10.2% on the year. Talksport has had a some of its best numbers for a while, and has risen back above 3m again to 3.1m reach – an 8.9% rise on the quarter and a massive 14.3% rise on the year. Meanwhile hours are back over 20m and are up a massive 25.4% on the quarter and 13.5% on the year. The station continues to receive newspaper marketing support from its parent company News UK, and they again seem to be more active in the sports rights market. Although not in this RAJAR period, they have recently bought some England Test cricket rights for upcoming overseas tours to Sri Lanka and the West Indies, while they also had exclusive radio commentary of the recent Anthony Joshua fight. Digital sibling, Talksport 2 has some positive numbers with reach up 1.0% on the quarter, although up 15.9% on the year. More importantly, hours are up 37.2% on the quarter and 49.9% on the year. Perhaps their EFL rights which largely sit on Talksport 2, are beginning to pay off? Good news for Talksport 2 listeners and others on the SDL mulitplex, is that owner Arqiva on Tuesday announced that they will be extending the reach of the mulitplex by a further 4m with 19 new transmitters due to come on board. That will also be useful for TalkRadio, which had some positive numbers as well, with reach up 30.6% on the quarter (32.8% on the year) and hours massively increasing, up 55.7% on the quarter (up 155.7% on the year). While these are good numbers, there’s no doubt that the format is expensive, and the station needs to see more growth to get it from 316,000 reach closer to somewhere around 1m. Absolute Radio had some great results last quarter, but slipped back to 2.4m this quarter, down 7.3% in reach, although still up 11.4% on the year. In hours terms they were flat – really flat. 18,517,000 last quarter v 18,514,000 this quarter. And they were up 6.4% versus last year. Christian O’Connell leaves Absolute Radio tomorrow, before he relocates to Australia to present the breakfast show on Gold FM in Melbourne. These therefore aren’t quite the final set of results for his tenure at the station. The wider Absolute Radio Network has fallen a little, down 3.2% on the quarter, although still up 7.2% on the year in reach. Hours fell 4.4% on the quarter and were down 2.0% on the year. Absolute 80s, however, did better this quarter, growing 5.8% on the quarter and up 14.8% on the year in reach. It also rose 13.5% in hours on the quarter, but fell 11.1% on the year. Recall that Absolute 80s has a new competitor on the block in the form of Heart 80s, and the newcomer has better coverage being on D1 rather than SDL where Absolute 80s moved to (Again, the increase in coverage of the SDL mux should benefit Absolute 80s in due course). Heart 80s also grew, rising 20% on the quarter (it’s too new for year on year figures), while hours dipped 5.5%. For those keeping score, Absolute 80s is 161,000 listeners ahead of Heart 80s with 1.560m listeners. Although as an aside, it’s clear that the two stations, whilst both featuring music from the 80s, are actually quite different. Read this excellent and enlightening Twitter thread from Nik Goodman to get a better understanding of the differences. Partly as a result of the success of Heart 80s, the Heart Brand (including all the local Heart stations, Heart 80s and Heart Extra) overall has had some good results. Reach is up 3.6% on the quarter and up 6.1% on the year, while hours are up 1.9% on the quarter, although down 1.9% on the year. Sister network, Capital Brand, fared less well with reach down slightly – down 0.7% on the quarter and down 0.8% on the year. Hours fared slightly worse, perhaps reflecting wider listening behaviours in their target age group, with a fall of 7.1% on the quarter and a fall of 7.8% on the year. The Kiss Network targets a similar age group, and saw falls on the quarter, although better results compared with this time last year. Reach was down 0.8% on the quarter but up 9.0% on the year, while hours fell 12.2% on the quarter but were up 3.2% on the year. The Magic Network didn’t have a great quarter with reach down 3.4% on the quarter, although up 5.8% on the year. Hours are down 3.7% on the quarter and down 2.7% on the year. None of their digital sister stations, Magic Chilled, Magic Soul and Mellow Magic are doing enormously well, with only Magic Soul seeing an increase this quarter. Mellow Magic is the biggest of the three with a reach of 432,000 and 1.7m hours. 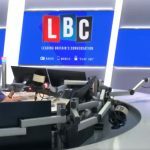 LBC is one of the better performers this time around, and whatever you think of it, their mix of politically charged presenters and the various politicians (and ex-politicians) that they get in for phone ins, seems to work well for them. Reach is up 7.1% on the quarter and 21.5% on the year to 2.2m. That’s their biggest ever audience under the current methodology (You’d probably have to go back to the 70s or 80s to get a bigger audience for its FM in London, and at that time, there were only two commercial stations in the capital). Hours aren’t quite a record, but they’re up 0.3% on the quarter and 5.7% on the year. Jazz FM isn’t a station I mention too often, but I probably should. Their reach is up 16.1% this quarter (and up 22.4%) on the year, to 591,000. Hours slipped to 1.7m – down 18.7% on the quarter, although up 7.6% on the year. I mention this particularly to put their numbers in perspective with some of the other newer, but smaller digital stations. The London radio market is always worth looking at – if only for signs of things to come. The average London listens to 19.4 hours of radio a week – so a bit less than the UK average. In part, that will be due to fewer people driving in London, but it might also be down to things like propensity to subscribe to other audio services. 19.4 hours isn’t the lowest we’ve seen – that was 19.1 hours a week back in Q2 2017. But it’s definitely part of a trend that last saw the average London listening to the radio for more than 20 hours being back in the middle of 2016. I will also dutifully point out that the most listened to radio station in London is, as always, Radio 4 with 2.7m listeners. That’s followed by Radio 2 with 2.1m, itself very closely followed by Capital London, also with 2.1m (I’m rounding here for simplicity). So Capital is the reach leader commercially (Radio 1 has a reach of 1.6m). The station is up in reach on the quarter (up 1.4%), but down on the year (down 4.6%). In hours terms, it’s not so good, with a 7.9% fall on the quarter to 9.0m hours and a 16.6% fall on the year. Heart London is the commercial music leader in terms of hours with 10.1m, up 11.6% on the quarter and up 8.8% on the year. Reach is down 4.2% on the quarter but up 7.0% on the year. Another figure to mull over when comparing the two Global stations is their respective average hours. For Heart it’s 6.7 hours a week, but for Capital it’s just 4.2 hours a week. That feels very low for a market leader. Just a year ago, it was 4.8 hours a week. Kiss is a close competitor to both these two services, with 1.9m reach (down 3.7% on the quarter and up 8.3% on the year) and 9.6m hours (down 10.1% on the quarter and up 14.4% on the year). It has 4.9 hours per week average listening. Magic has not had a great set of results this quarter in London, falling 12.3% in reach on the quarter and down 5.7% on the year. In hours, they’re down 11.6% on the quarter and down 4.6% on the year. A couple of other Global services with good figures are Radio X and Smooth. Very different, but both showing positive moves. Radio X has seen its best reach since its rebrand from Xfm, and indeed even if you include Xfm’s numbers, it’s best figures since 2013. It’s reach is up 4.3% on the quarter and remarkable 40.5% on the year, to 531,000. In terms of hours, it’s an even better story, with hours up 14.3% on the quarter and up 81.9% on the year to 3.7m. That’s an average of 7.0 hours a listener per week, and the best hours the station has had since it was Xfm in 2004! Global has spent a lot over time marketing the service, and it may be coming to fruition. Smooth said goodbye to Russ Williams on breakfast, but he left as the station put on 13.3% reach in London on the quarter (and up 6.6% on the year), while hours were up 6.8% on the quarter and up 0.3% on the year. BBC London‘s numbers have been a little all over the place of late. Last quarter they had some incredibly good record breaking numbers, and things have, perhaps, “normalised” a little this quarter. Reach is down 20.9% on the quarter, but still up 38.0% on the year to 454,000. Meanwhile hours are down 50.5% on the quarter, but up 59.6% on the year to 2.1m. The station’s numbers are, frankly, bouncing ridiculously. 50% swings between quarters don’t happen, and it suggests that measuring the station’s audience is hard. BBC London aside, it feels like RAJAR in London isn’t swinging around as wildly as it had in the past, which is much better for the currency. 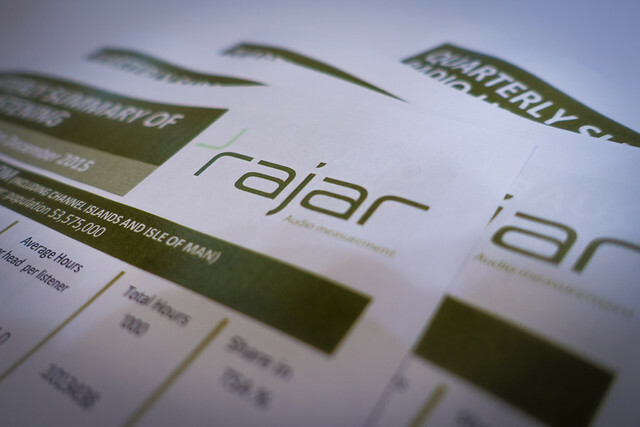 RAJAR’s MIDAS survey isn’t actually part of the regular RAJAR release and was published last week. But I thought that there were a few things that were worth mentioning here. 11% of the UK population listen to a podcast in any given week – that’s 6.0m people (down very slightly from last time around, although the trend remains upwards). Radio’s share of all audio is at 75% which is the same as last time around. But if there’s a theme, it’s that the share of audio that is live radio for 15-24s has fallen below 50% for the first time. In the Winter 2017 survey it was at 50% for this demo, and 63% for 25-34s. However, in this new release, the share amongst 15-24s has fallen to 46%, while that among 25-34s is the same as before. On the other hand, on demand music services (e.g. Spotify) has grown from 28% to 34% for the younger demo. This rate of change is fast, and it’s entirely conceivable that within a year, radio will have fallen below on demand music services for 15-24s. At the moment this is a youth oriented issue. Among 35-54s, only 6% of audio is on demand music, and it drops to 1% for 55+. That offers some comfort to radio, but it will need to adapt to match the growth of these new services. The full MIDAS release is here. All my previous RAJAR analyses are here. Source: RAJAR/Ipsos MORI/RSMB, period ending 1 April 2018, Adults 15+.